Georgia coach Tom Crean prepares to illustrate a play on the sideline during the Bulldogs' game at Arkansas on Jan. 29 as junior guard Tyree Crump comes off the court. Crump's mother was unhappy with comments Crean made about his players after their loss Saturday to Ole Miss. 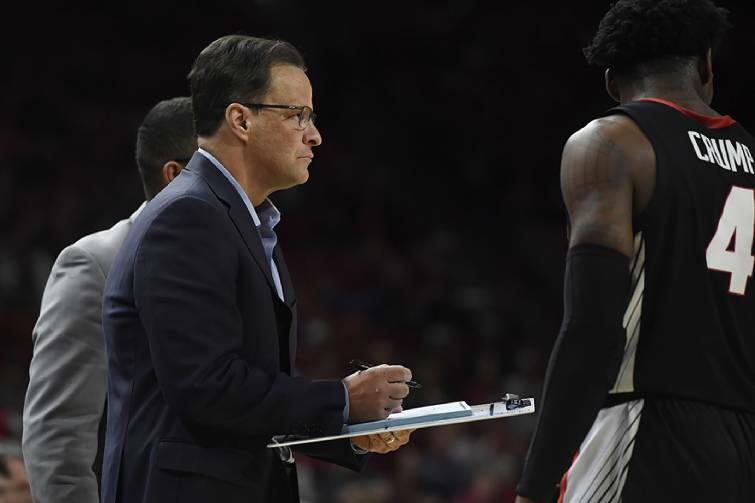 Comments made Saturday by first-year Georgia men's basketball coach Tom Crean after an 80-64 home loss to Ole Miss did not sit well with the mother of one of his players. Saturday's setback was the eighth consecutive Southeastern Conference defeat for the Bulldogs (10-13, 1-9). Crean explained afterward that Georgia's struggles are partially due to the fact he didn't run off any players from the previous regime of Mark Fox. "It's all on me, because I'm the one who decided to keep these guys," Crean said in a news conference. "The last thing I can do is now get overly mad at them, because I'm the one who made the decision, so I live with that every day. It doesn't mean that they're not great kids, but very few programs — when there is a takeover and there are guys who haven't done it at any point really in their careers, a lot of these guys move on. "That's what happens when there's a job change, and I didn't do that." Shantell Crump, the mother of junior guard Tyree Crump, responded to Crean's comments with a post on Twitter. "Really? Tom Crean, you want to blame the players?" she said. "What coach would say something like this to the media about his players." Georgia will try to snap its skid Tuesday night at Texas A&M (9-13, 2-8), but the Bulldogs could receive some very good news well before that. Anthony Edwards, a 6-foot-5, 215-pound shooting guard from from Holy Spirit Prep in Atlanta, is scheduled to announce his college decision this morning. The No. 2 overall prospect nationally in the 247Sports.com rankings is considering Florida State and Kentucky in addition to the Bulldogs.